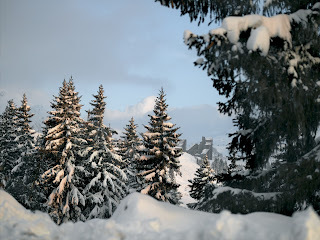 Before I set off to the French resort of Avoriaz, I spent a few days with one of my oldest friends. Mostly, this was to spend time with her and her gorgeous little baby. But also, I was robbing her of all her ski gear. I was only going away for a couple of days, and I didn't think shelling out hundreds of pounds on kit before I set foot on the slopes was a great idea. She was pretty adamant that I would be a horrible skier. She pointed out, quite rightly, that I have terrible balance, am clumsy, lack coordination and am doggedly competitive. This is all true. I hate it when I'm not instantly the best at something. I get cross with myself, and with anyone who dares to take naturally to something. As evidenced by my attempts at punting in Oxford. But you know? I wasn't actually that bad. I wasn't nervous until I realised that everyone had asked "Are you scared?" when I told them it was my first time. I hadn't thought about being scared... but then I was. When I went out into the dazzling sunshine, I was starting to worry. People were skiing past me at what I believed to be a blistering speed. My instructor came out, introduced himself, and told me to get my skis on and follow him. "WAIT!" I cried. "I DON'T KNOW HOW!" After he clipped me into my skis, he zipped off again. I had thought that the lesson would begin with some kind of theory, perhaps even in a classroom with some hot chocolate, but that daydream was soon forgotten. It appeared that we were to learn by doing - the worst kind of learning. We went over to the bunny slope (actually named the Haribo Park, which I found comforting and hunger inducing). I know most beginners talk about their dislike of being outshone by children, but the little toddlers zipping around at my knees didn't bother me. In fact, I found their heads to be at a very handy height when I lost my balance. Plus, when we went up the lifts where you shove the seat between your thighs, they were dropping like flies. One by one they lost their balance and fell to the floor like little dumplings. It was hilarious. Don't get me wrong, they were fine. They didn't even seem to notice they'd fallen. Quick as a flash, an instructor would nip in and pull them out of my way. With each slope we came to, I panicked. They all looked a little too like runs for my liking. I thought we'd just fanny around on tiny slopes until we got the hang of it, but after he'd taught us how to slow ourselves down and steer, we were up and away to the big boy action. That's right - a GREEN slope. I still began each run with a scream, don't get me wrong. But I was moving downhill! With skis on my feet! I soon perfected the art of a slow descent, by effectively skiing with my brakes on. But a blue run (BLUE) caught me off guard, and I was soon flying to the bottom at great speed. I started with my skis facing forward, and there were so many people around me I couldn't slalom as I had been, which helps you to control your pace. I tried pointing my skis together to slow down, but I'd built up too much speed already. When I realised I couldn’t slow down, and I couldn’t hear whatever my instructor was yelling at me, I gritted my teeth and went with it. I'd love to say that this gave me a taste for adrenaline, for high octane, fast past action. But I was TERRIFIED. I had no control whatsoever, didn't feel safe at all, and honestly didn't enjoy that feeling too much. Honestly? I screamed from top to bottom.
" TELL ME WHAT TO DO!" "Oh God, Oh God, Oh God, Oh God"
"How do I slow down? HOW DO I SLOW DOWN?!" "THIS IS HOW I'M GOING TO DIIIIE..."
"I've had 18 straight whiskies......I think that's the record." But I didn't die. Obviously. When I got to the next slope, I went back to my lovely and calm speed. A few times, I even allowed myself to take in a second or two of the amazing view. Not for too long, of course. I'm not a mug. At the side of most of the narrow runs there was either a dense patch of fir trees, or a startling vertical drop into a snowy abyss. Beautiful, don't get me wrong, but I didn't want to be falling down it. I actually didn't fall over once. No one was more surprised about this than me. Or maybe my friend. When I raced back to my apartment to text her the news of my amazing talent and skill on the slopes, she was proud. "You were flying today, buddy. But a little too close to the sun." If you don't watch Arrested Development, that may not be as funny as I found it.